We all love giving gifts that will benefit those we love. 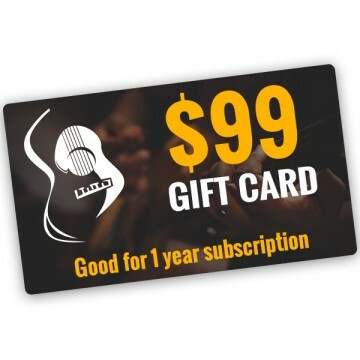 What a better gift than giving a 1 year’s worth of guitar lessons to that aspiring guitar player. What’s even better is the cost to you. The gift card is valued at $99, but you only pay $25 for the gift. How it works: Click View Card below, fill out the information, and click add to cart. Click the View Cart button at the top, and you’ll be taken to the cart page. Make sure you click on the BLUE COUPON to get the $99 gift card for only $25! Click Checkout and fill out the information. Once the checkout is complete, the gift card will be sent to whomever you set to send. PLEASE NOTE: It’s possible that the gift card may get sent to the receiver’s junk mail box. If they do not receive the gift card, have them check their junk mail. If you have any issues, please go to the Customer Support page, or email support@csgacademy.com.